Six or 12 weeks sessions. 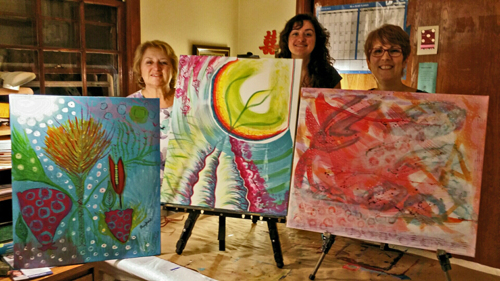 Each class begins with a guided meditation and throughout the course, you will learn to use and master alcohol inks’ techniques, collage, acrylics, mixed media and visual texture on various surfaces to practice relinquishing fear, look at reality like you never have before and summon the courage to paint from the heart. During the first six weeks, you will be gently and expertly coached to both learn various pictorial techniques and complete exercises to help you open your heart and trust its guidance to complete a painting.